When you want to get a great dump trailer at a competitive price, come to Hall Trailer Sales. Your satisfaction is very important to us, and manufacturers’ warranties are available for the trailers we sell. Visit our location or give us a call to learn more about our dump trailers. 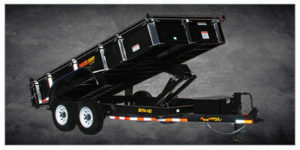 Invest in a dump trailer if you need to haul loose material on a regular basis. At Hall Trailer Sales, we have several dump trailers for you to choose from. Check out some of the options that we have available. Models include the 6000 series, 7200 series, 8200 series, and 9600 series.